Someone tore down & burned a southern couple's rainbow flag. Now everyone is putting them up. Today is Give OUT Day. So where should you send your donation to help LGBTQ people the most? The Washington Post said Mike Pence doesn't support conversion therapy. No one's having it. This town's Confederate flag was taken down. So they 'vandalized' the flagpole with a rainbow flag. The discovery of a federal tax return filed by Donald J. Trump — showing he did in fact pay taxes at least once, more than a decade before he won the White House — was greeted as huge breaking news, and MSNBC certainly hyped it as such with tweets and promos and on-screen reminders. 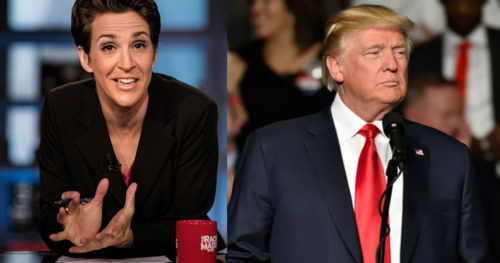 Given that every president since Jimmy Carter has agreed to release his Internal Revenue Service returns, the fact out host Rachel Maddow got her hands on Trump’s return from 2005 did certainly merit all the breathless excitement. There was so much interest, in fact, that both Maddow’s blog site, maddowblog.com, and the website of Pulitzer Prize-winning investigative journalist David Cay Johnston both crashed. But as it turns out, the news once delivered quickly fell back to earth. The White House preempted the breaking news with a pre-show statement that acknowledged President Trump paid $38 million in federal income taxes on reported income of $150 million in 2005. That is the only return obtained, a joint return filed by both Trump and his newlywed third wife, Melania. It was given to Maddow by Johnston, who said it was “delivered over the transom” one day, a colorful way of saying it showed up in his mailbox. Johnston and Maddow speculated the return might even have been sent to him by the White House itself. Trump’s two-page 1040 from 2005 showed he paid an effective tax rate of 25 percent, which was confirmed by the White House. The president’s eldest son, Donald Trump, Jr., tweeted his “thanks” to Maddow. Officials acknowledged that Trump wrote off “large scale depreciation for construction,” reducing the taxes he would otherwise have paid. The White House statement concluded that he did nothing wrong, but scolded MSNBC for obtaining his forms and making them public. Trump had promised throughout the presidential campaign that although he paid “hundreds of millions of dollars in taxes,” he could not release his returns because he was under a “routine audit” by the IRS. After the inauguration, however, adviser Kellyanne Conway revealed the president had no plans to reveal his returns now or at any time, dismissing it as of no interest to the American people. © 2010 - 2019 LGBTQ Nation, All Rights Reserved.